It has been twenty years since two of this regions finest songwriters and performers started working together, and to celebrate this anniversary Rabaul’s (PNG) George Telek and Melbourne’s David Bridie are playing shows up and down the NSW and QLD east coast. Together, Telek and Bridie will perform highlights from their extensive back catalogues, both on their own and together on stage. These two unlikely collaborators: Telek – a grassroots PNG villager – and Bridie – a suburban Melbourne boy – have forged a close friendship from years of recording and touring together. This is evident when you see them perform together: the warmth radiates off the stage. Telek will be releasing his new album “Pairap Ken” for this tour. This, his fifth international album, is a beautiful collection of Tolai songs – some traditional, some string band – but all of them very Rabaul … with a hint of Beatles-esque songwriting. Bridie will be performing songs of his latest album, “Succumb”, with other songs from his extensive back catalogue of solo material, as well as material from his bands My Friend the Chocolate Cake (Cake) and Not Drowning, Waving (NDW) tunes. They will be joined by fellow Papua New Guinean, and Yothu Yindi drummer, Ben Hakalitz, and will be mixed by legendary NDW audio-visual mixer Timothy Cole. These will be unique concerts not to be missed. It was back in 1988 that Bridie’s band, Not Drowning, Waving collaborated with Telek at the Pacific Gold Studios in Rabaul to record the acclaimed Tabaran album. Telek was already PNG’s foremost recording artist with top selling solo, rock, and stringband albums. Since then Bridie has produced four international albums for Telek, including one, Serious Tam, at Peter Gabriel’s Real World Studios. This was voted pop album of the year by the Times newspaper in England. 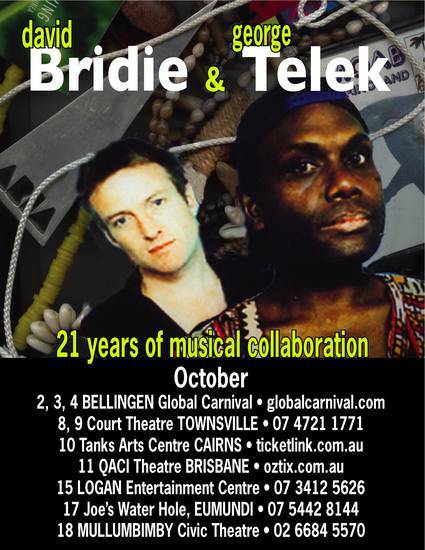 Telek and Bridie have toured together throughout Melanesia in PNG, the Solomon Islands, Vanuatu, and New Caledonia. They have toured together throughout Australia and in New Zealand, the UK and Germany. Most recently, in May this year, they toured together on a critically acclaimed, sold-out, standing ovation “Sing Sing” (the Melanesian Orchestra) tour of 7 dates in the USA. Telek comes from the village of Raluana, near Rabaul in the Papua New Guinea island province of East New Britain, where he continues to live with his wife Bridget and their seven children, despite the volcanic eruption which destroyed the idyllic Pacific town in 1994. “The traditional songs are about our daily life, songs that the people sing when they pick the bananas or collect the coconuts or go fishing,” he says. The towns and villages have now been rebuilt and because the Tolai people represent a living tradition, the latest eruption too has now entered their songs. Telek’s songs and his hauntingly beautiful voice, traverse many musical styles perfectly capturing the spirit of the proud cultural heritage of the Tolai people of Papua New Guinea. Songs of the midal (magic charms) and malira (love magic) draw on Tolai culture blending contemporary grooves with Melanesian rhythms, enriched with textured environmental sounds. Rich and unique three-part harmonies are sung both in the Tolai language of Kuanuan and in a creole called Tok Pigin. Telek also delves into Stringband Music: a rich blend of guitars and ukuleles sitting beneath interwoven vocal lines and harmonies in a unique gospel/country folk style that is typical across Melanesia. Telek received an ARIA award for Best World Music Album for his debut Telek CD and received an MBE for services to the PNG music industry. Seven time ARIA award-winning songwriter and composer David Bridie has enjoyed a distinguished career as one of Australia’s most innovative and classy artists. Whether as an international soundtrack composer, a leading expert on and producer of Melanesian music, as a uniquely Australian songwriter, or a piano player/singer in his solo career, or with his bands Not Drowning, Waving or My Friend the Chocolate Cake, Bridie has certainly stamped his mark with style and brilliant songwriting. As lead vocalist, keyboard player, co-composer and co-producer of critically acclaimed band Not Drowning, Waving, (NDW) David built a world-wide reputation through the six albums and two soundtracks the band released during its illustrious career. NDW have just re-released their back catalogue through Liberation Records and their new remix album “Maps for Sonic Adventurers” has just been released, as well as a double album compilation entitled “Through the One Last Door”. With My Friend The Chocolate Cake (the Cake), David ventured on a different musical journey, an all acoustic outfit teaming up with cellist Helen Mountfort and continuing to make music that appeals to a broad audience in a variety of countries. The Cake have won two ARIAs for best Adult Contemporary Album: one for “Brood” and another for “Good Luck” .The Cake’s latest album, “Home Improvements”, was released early 2007. In 2008, the Cake won the prestigious Herald Angels award at the Edinburgh Festival before returning home to tour regional Victoria. David's debut solo album, “Act of Free Choice” was released by EMI Records Australia in May 2000 and nominated for Album of the Year in the 2000 ARIAs. It was released in the UK on Parlophone. It was a sublime collection of moods and piano based songs. He followed this up with “Hotel Radio”, produced by Nick Littlemore, in 2004, which delved into the technology of the studio more. His latest CD “Succumb”, produced by Christian Scallan, was released to stunning reviews in late 2008. It is a slight departure for him, comprising of rockier and edgier pop themes. David has also been an award winning soundtrack composer having won two ARIAs and two AFI awards for best soundtracks. He has scored over 100 films including Proof, Myth of Fingerprints, The Man Who Sued God, That Eye the Sky, Tempted, In a Savage Land, and most recently, the TV series, Remote Area Nurse (RAN) collaborating with the cream of Torres Strait Islands music life, and the Working Title UK film, Gone. This year he has worked on the films Two Fists One Heart and Brand New Day and, for television, series two of The Circuit.